Trolls are large, ape-like humanoids endowed with three eyes. Their powerful arms and claws deal massive physical damage. Trolls are also very strong defensively, possessing high health levels and a particularly effective ability to quickly and fully regenerate health during combat. Their greatest vulnerability is to fire, which not only damages them, but also impairs their capacity to self-heal. 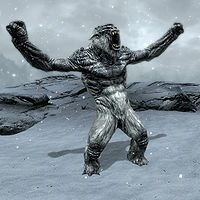 Maintain high health vigorously when fighting them, as two or three blows from a troll can be lethal, and these can be delivered against you in lightning-quick succession. Other tactics are maximizing armor and physical damage defenses, and using combat methods which deal fire damage. If you have more than one fire-enchanted weapon to choose from, lighter, faster weapons may be more effective than heavier, slower ones. If you use hit-and-run or evasive tactics, trolls will almost certainly outlast you, given their ability to self-heal. Trolls can be encountered both in the wilderness, particularly in the Rift, and in the deep underground of caves and Dwarven ruins. They have even been spotted in ancient barrows. 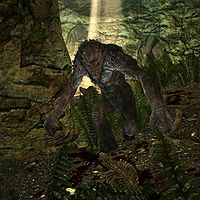 There is one unique troll encountered in the game, Udefrykte, who is encountered in the Dawnstar Sanctuary during the quest The Cure for Madness. The locations inhabited by frost trolls are further north and at higher elevations than those of their generic cousins (who are sometimes called "cave trolls"). Frost trolls are significantly more powerful—both offensively and defensively—and are partially resistant to frost damage. They are distinguishable by their white fur. Armored trolls are used by the Dawnguard in battle. They have the same statistics as regular trolls, despite the name suggesting they might be more powerful. The only difference to a regular troll is that they wear armor over their bodies. 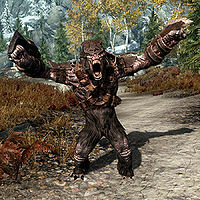 If you join the Dawnguard, you can hire an armored troll for 500 gold to act as a follower in battle, although it is only able to follow simple commands such as waiting in a specific location (much like a dog). If you are level 20 or above, an armored frost troll will be provided instead of a regular troll. For historical information on trolls, see the lore article. Esta página foi modificada pela última vez à(s) 22h29min de 19 de maio de 2015.